Donahue (1993) reported, for the first time, a record south of Mexico. He examined a single specimen from GUATEMALA, collected 14-18 July 1991, by Peter Hubbell. Collecting Methods: Frequently is taken at lights in eastern Mexico. both specimens collected by A. & M. E. Blanchard and deposited in the USNM. Donahue, J.P. 1993. 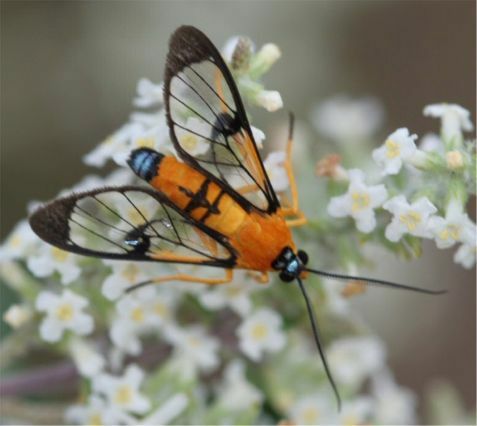 Six species of tiger moths (Arctiidae: Lithosiinae, Ctenuchinae) new to the United States fauna, with notes on their nomenclature and distribution in Middle America. Journal of the Lepidopterists' Society 47(3): 199-210, 6 figs. Franclemont, J.G. 1983. Arctiidae, Pp. 114-119. In: Hodges, R. W. et al. (eds. ), Check list of the Lepidoptera of America north of Mexico. E. W. Classey Ltd. & Wedge Entomological Research Foundation, London. Perez Ruiz, H. & R. Sanchez Sarabia. 1986. Entomofauna de la region de Los Tuxtlas, Veracruz III. Descripcion y algunas notas sobre la ecologia de una nueva especie del genero Abrochia H.-Schaff. (Lepidoptera, Ctenuchidae). An. Inst. Biol. Univ. Nac. Auton. de Mex. 56, Ser. Zool. (l):233-240. Watson, A., D.S. Fletcher & I.W.B. Nye. 1980. In: I.W.B. Nye. (ed. ), The generic names of moths of the world. Vol. 2. Trustees of the British Museum (Natural History), London, xiv + 228 pp.